I seem to remember a review of a yacht some years ago where the saloon was in the stern where the aft cabins normally go. Aft cockpit yacht so saloon under cockpit. Yacht from memory about 50 ft so possibly semi custom. Having a galley kitchen at the forward end of the cabin was a must have for us - and particularly my wife who does a lot of the cooking as I get seasick when doing it. We had an L, almost U, shaped galley by the hatch before but it was annoying because it could get wet unless the hatch was closed, whereas a little water occasionally down the steps didn't otherwise matter, it blocked off the entrance to one aft cabin and people kept going past inanely. The galley kitchen up forward only keeps all the people traffic in the aft of the boat and the cook can be wedged comfortably in any seaway with their back to the hard back of the central sofa facing the table. Compared to walking the length of even a small kitchen on land to the table is a bigger distance than the few steps from the cooker up front to the companion way, and even less just to pass a plate to people sitting round the saloon dining table on the rare occasions the cockpit is too cold for an evening meal. In a hot climate it might be harder to get heat from cooking out of the galley if it is positioned well forward. On the other hand on boats of this size having it aft doesn't quite mean having your head out of the companionway hatch while prodding the bacon, and they tend to have more openings anyway. On Duet (an Edwardian gentleman's racer) the galley is very much in the fo'c'sle, a seriously cramped arrangement. We sail in the heat mostly and find that with a small opening hatch above the galley and a large one above the dining table behind then most of the heat is dissipated, but to be honest we don't eat downstairs in the heat. Once the cooking is complete we only drop down there for more booze and by the time we stop drinking it's usually cool enough to wash up and sleep. For the heat reason though, we don't tend to eat on board when in a marina. 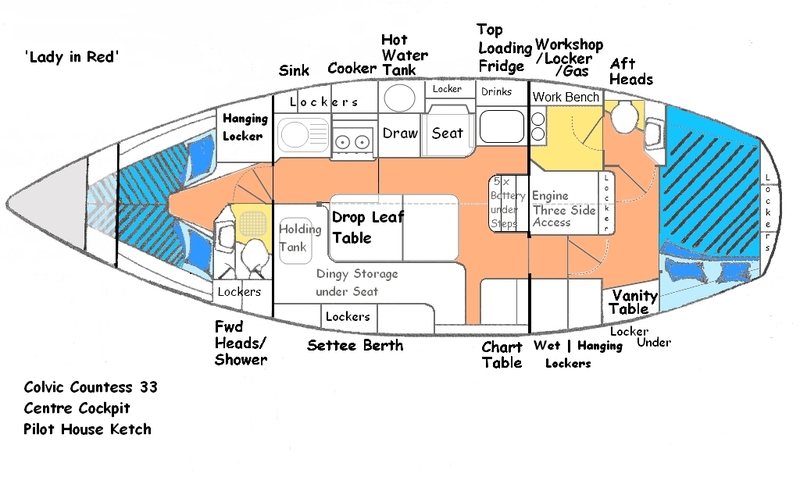 Having just bought another (older) boat, the location of the galley is totally irrelevant for me because I can’t afford to buy food/provisions any more. My Countess has the galley at the forward end of the saloon, the only problem with it is if someone wants to go into the forward cabin when I'm cooking. The fridge is aft, so easily accessed. Do tell me what a "vanity table" is. I'm worried that my little boat is incomplete. Isn’t that just what estate agents refer to as a “vanitory unit”. Just BS! Obvious init? It's where you keep your Vans! Alternatively, it's the lid to the locker underneath. Last edited by LadyInBed; 04-02-19 at 01:02. I am just glad my boat is now big enough to have a galley. I ussualy use the bbq.